The University of Hawai’i basketball team will try to find the road to recovery in Irvine, Calif., on Thursday. 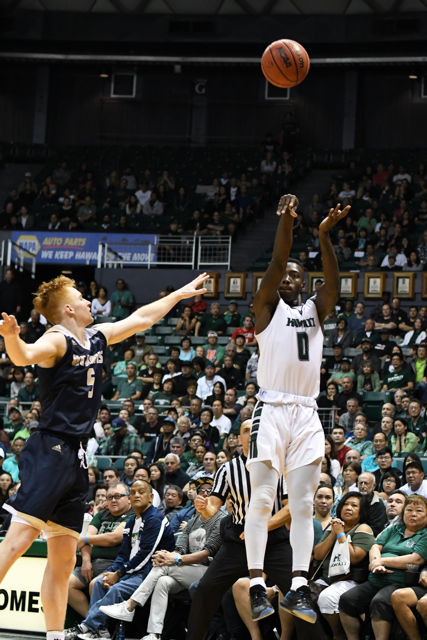 The struggling Rainbow Warriors will face the surging Anteaters in a Big West Conference game at the Bren Events Center. It is scheduled to start at 6:00 p.m. (Hawai’i time) and will be available through video streaming at www.espn3.com. 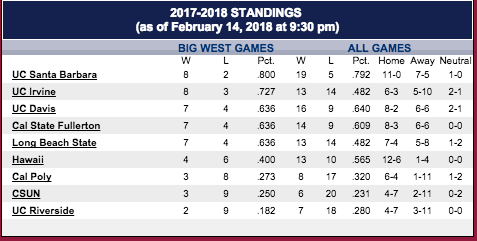 Hawai’i is 13-10 overall and in sixth place in the Big West at 4-6. UCI is 13-14 overall and in second place at 8-3. The Warriors are on a five-game losing streak; the Anteaters are on a five-game winning streak. It is the first meeting this season between the teams – they will play again in Honolulu on Feb. 24. The Anteaters have surged into contention with a combination of balanced scoring, defense and rebounding. They currently lead the Big West in points allowed (61.4), rebounds (41.4) and rebounding margin (9.7) in conference games. The top six scorers for UCI are all sophomores. Evan Leonard, a 6-foot-1 guard, leads the team with 12.9 points per game and 50 3-pointers. Eyassu Worku, a 6-2 guard, is averaging 11.2 points and 3.6 assists per game. Tommy Rutherford, a 6-8 forward, is contributing 10.9 points and 6.0 rebounds per game, and leads the Big West with a .599 field goal percentage. Jonathan Galloway, a 6-10 junior center, is averaging just 3.7 points per game, but leads the team with 7.7 rebounds per game and 41 total blocked shots. Hawai’i, meanwhile, is in dire need of a positive performance. The Warriors last three games have resulted in losses to the bottom three teams in the conference (Cal Poly, UC Riverside and CSUN). 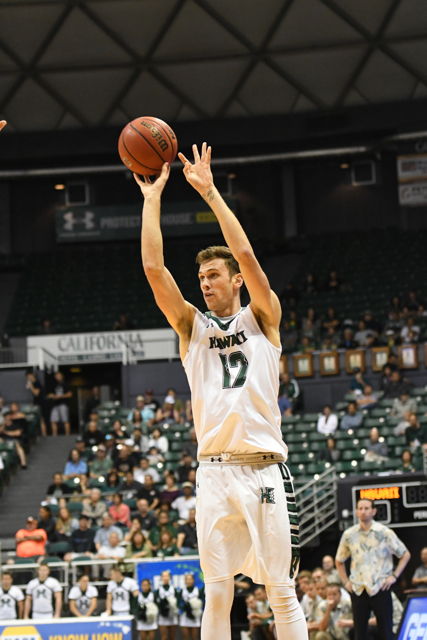 As a result, Hawai’i is now just one win ahead of Cal Poly and CSUN in the standings. Mike Thomas, a 6-7 senior forward, leads the Warriors with 13.7 points and 6.1 rebounds per game, and a .594 field goal percentage. Sheriff Drammeh, a 6-3 junior, is contributing 10.8 points and 3.3 rebounds per game. Junior guard Brocke Stepteau is averaging 9.9 points per game, and senior forward/center Gibson Johnson is at 9.7 points and 4.9 rebounds per game. Freshman guard Drew Buggs is averaging 7.8 points per game and leads the team with 3.7 assists per game. Junior forward Jack Purchase is contributing 7.7 points per game, and leads the team with 40 3-pointers. The Anteaters are 6-3 at home this season, while Hawai’i is 1-4 on the road. The Anteaters went 2-0 against the Warriors last year, including an 84-56 win at Irvine. Where: Bren Events Center (6,000) – Irvine, Calif.
Radio: ESPN 1420 AM. Neighbor islands can listen live on KNUI on Maui, KPUA on the Big Island, KTOH on Kaua’i, and KNWJ in Pago Pago, American Samoa. I have a good feeling that Ganot and Co. will come up with a game plan to pull off this upset. For the last couple years, they seem to lose when the fans get their expectations up, and then they come back and pull out a big win just when the fans are ready to give up. This is one of those times when fans are ready to give up, so it must be time for a big win.